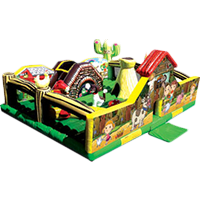 “Inflatable fun” is great entertainment and exercise for children of all ages. However, recent news of “Bounce House” accidents may unnecessarily scare some parents away from this form of fun. Customers need to be “in the know” and correctly informed of what to look for and ask about when choosing which items to rent and which company they hire. The first question one should ask when investing in inflatable rentals is “ Does your company have insurance?” Any legitimate rental company in Savannah will have insurance and be able to provide a Certificate of Insurance. Some companies can offer a lower cost on rentals, but the priority of the adult responsible for renting the items should be safety above saving a few dollars. Along with that, they need to ask, “Does the company perform the setup of the inflatables and what requirements do they have for setup?” There are some places that a unit can be rented and picked up by the customer for them to take home and set up themselves. The customer is not trained to do it properly and companies that are insured couldn’t offer that, as their insurance company wouldn’t allow it. Will the company set up anywhere or will they refuse the job if it cannot be set up properly and safely? Some renters will threaten to take their business elsewhere if the company tells them they can’t set up exactly where the customer would prefer it. A company whose main concern is the safety of the customer and their guests will be fine with that and refuse to do the job in an unsafe manner. How does the company secure units to the ground? What kind of ground stakes and/or ropes are used to tie the unit down? Different areas can require different kinds of ground stakes. Can accidents happen? Absolutely. What causes accidents? The leading cause is riders not following safety instructions! 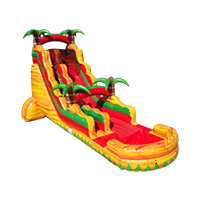 What are the instructions for safe operation of inflatable rides? First and foremost, NO HEADFIRST SLIDING on inflatable slides. 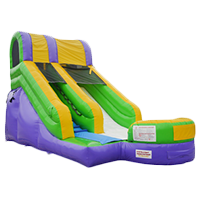 This key safety rule is followed by no flips down slides or in any inflatable unit, no wrestling or piling on others (boys love to do this but it can lead to a broken arm), no pushing or horseplay, no jumping off of an inflatable or climbing over a wall to jump onto another part of the unit. When you get to the bottom of a slide, get out of the way so the other rider can come down and check before sliding make sure there is no one in the way. Don’t exceed the maximum capacity in the unit. Don’t mix children of different ages together in a unit. Group the kids by age or size and make sure a three-year-old and a 12-year-old (or adult) are not playing at the same time. NO adult and child should ever go down a slide (dry or wet) together! An inflatable needs to be supervised by an adult AT ALL TIMES. Kids will be kids, and they get carried away by the fun and excitement and sometimes forget to follow the rules. An adult needs to keep reminding them of these rules as they would around a swimming pool. Other safety rules include having only one person at a time going down a slide, no jumping near the door or too close to another rider, no gum, no shoes, no sharp objects, no eyeglasses, keep hands off nets, and do not bounce against the sides or near doorways. Have a Question? Check Our FAQs! Are all inflatable rides safe? NO. If a company says they don’t offer a particular unit because it’s not safe, listen. Many times, the customer doesn’t realize why an item is dangerous. Sumo wrestling results in many broken wrists due to falling backwards and individuals catching themselves with their hands behind them. Who knew! Does a waterslide have a pool or wall at the bottom so a rider can’t go off the end and a retaining wall behind the climb so they won’t fall backwards while climbing up? Does a large slide have a net at the top to force the rider to sit down and slide rather than jumping down the slide? A knowledgeable company is aware of these dangers and their insurance companies often won’t allow them to own units that have seen too many accidents. The safest bet is to use a company that has experience and knowledge and has learned over time what the best procedures are to ensure a SAFE, and ultimately fun time, by all. 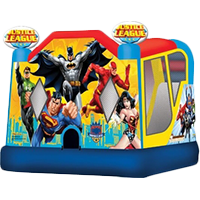 Sun Country Amusements has been operating an amusement rental company for the past 24 years and seeing first-hand what causes injuries on inflatable bounce houses and other interactive inflatable rides along with studying numerous articles on accidents such as these. I hope this will be a helpful guide to help make the public more knowledgeable in the use of inflatable entertainment. Such items are amazing fun along with a great source of exercise for today’s children, teen and adults! If you’re ready to learn more about our inflatable rentals across the Savannah area, be sure to contact our team today for fun, safe adventures!